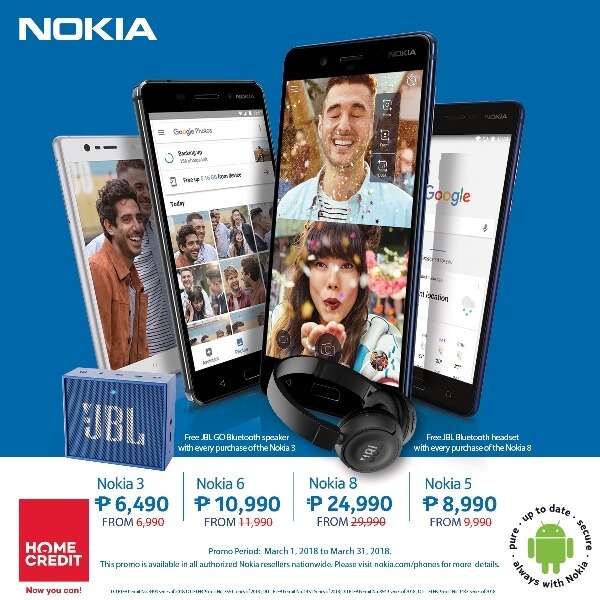 HMD Global recently announced their new promo offerings for their Nokia Android smartphones, where consumers can get a free JBL product and price discounts. Giving consumers a good summer deal, you can now buy the Nokia 3 for only Php6,490 and get free JBL GO Bluetooth speaker worth Php1,599. On the other hand, get a Php1,000 off with every purchase of the Nokia 5 to enjoy its 13-megapixel rear camera with dual-tone LED flash, allowing users to capture vivid photos and full-HD videos at 30fps. You can get yours at the promo price of Php8,990. Meanwhile, the 5.5-inch Nokia 6 elevates multimedia entertainment experience as it is equipped with Dolby Atmos technology. It also sports 16-megapixel rear camera and 8-megapixel front shooter. It now retails for a promo price of Php10,990. The brand’s flagship device Nokia 8, however, boasts three world-firsts of smartphone technology, including its partnership with ZEISS optics, Dual-Sight technology, and OZO spatial 360-degree audio. Consumers can now get it for a discounted price of Php24,990. Moreover, you can bring home two units of the Nokia 2 for only Php10,000! To enjoy these deals, visit any authorized Nokia reseller, including MemoXpress and argomall.com. You can also grab these offerings at any Nokia store, kiosk, or exhibit near you. The promo runs until March 31, 2018. In addition, Nokia revealed that it extended its partnership with Home Credit. Through this, the Nokia 8 may be availed at 0% interest for 12 months, while the Nokia 3, Nokia 5, Nokia 6, and Nokia 2 are at 0% interest for 6 months.